Daily Illuminator: This Supplement Is Monsterrific! April 29, 2013: This Supplement Is Monsterrific! What do you get when you collect 48 monsters in one spot? If you guessed GURPS Classic: Monsters, you're right! (I guessed "a good reason to change my pants," which the judges accepted on a technicality.) 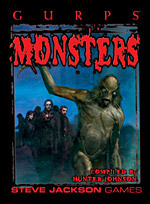 Newly released to e23, Monsters is a classic GURPS sourcebook of dozens of blood-curdling critters. They range from the mythical medusa, the cryptozoological chupacabra, the literary headless horseman, and even wholly (yet unholy) original threats. Each comes with the GURPS stats and information needed to make the most of this monstrous encounter, with biographies, motivations, variations, and even possible tweaks to make them fit in other genres. Here at e23, we believe that scaring is caring. Don't delay getting this display of decay; pick up GURPS Classic: Monsters today!